We’d love your help. Let us know what’s wrong with this preview of The Long Silence by Helen McPhail. The horror of the Western Front trenches is a well-worn theme but what was life like on 'the other side of the Western front' in the First World War? This account, based on original sources including diaries, memoirs, family records, secret diaries written during the war, vivid memories and official records, show how the rich agricultural and industrial areas of northern F The horror of the Western Front trenches is a well-worn theme but what was life like on 'the other side of the Western front' in the First World War? 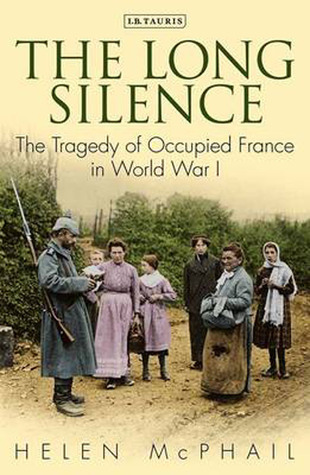 This account, based on original sources including diaries, memoirs, family records, secret diaries written during the war, vivid memories and official records, show how the rich agricultural and industrial areas of northern France were invaded, occupied and exploited between the summer of 1914 and the Armistice in November 1918. Factories were stripped, household furniture and fittings requisitioned, food supplies taken, the population maltreated and malnourished and even taken to forced labour camps; the population lived in terror. Starvation loomed and contact with the outside world vanished until Herbert Hoover set up his scheme of aid which kept the population alive during the war. This fascinating account describes how - in the struggle to survive - French civilians responded in ways familiar in the Second World War: escape networks, espionage, clandestine news-sheets, help for British soldiers trapped behind enemy lines. To ask other readers questions about The Long Silence, please sign up.